Original Editors - Emily Nicklies from Bellarmine University's Pathophysiology of Complex Patient Problems project. Multiple System Atrophy (MSA) is defined as a sporadic, progressive, neurodegenerative adult-onset disorder that can affect the autonomic system causing autonomic failure, basal ganglia causing parkinsonism, and/or cerebellum causing ataxia in any combination. This disorder is considered MSA when there is a combination of symptoms arising from the components just mentioned (autonomic failure, parkinsonism, and/or ataxia). In order for a patient to be diagnosed with MSA, there have to be at least two components involved. There can be any combination of symptoms present from the three components. In MSA, patients often have symptoms that are characteristic of just one component: autonomic dysfunction, parkinsonism, or cerebellar dysfunction. As the disease progresses, additional symptoms will emerge. Some patients may initially have autonomic features and may be diagnosed with pure autonomic failure (PAF). o Patients who are initially misdiagnosed with PAF may later be correctly diagnosed with MSA as the neurological symptoms of parkinsonism and/or cerebellar ataxia appear. The prevalence of MSA has been estimated to be 4.4 per 100,000 people. (Diedrich). The mean age at onset has been reported to be between 52.5 and 55 years (Diedrich). MSA is found more often in men than in women (Diedrich). Wenning et al. completed an analysis of 100 patients with MSA and measured their disability. Results showed that patients with MSA become disabled at a faster rate than patients with Parkinson's Disease. MSA is classified by the most dominant symptom exhibited by the patient. Autonomic dysfunction, primarily orthostatic hypotension, is present in approximately 75% of people with MSA. When a parkinson-like movement dysfunction is the prominent feature, the disease is categorized as MSA-P. Parkinsonism has been identified as the initial feature in 46% of patients with MSA, but eventually over 80% of patients with MSA will develop parkinsonian features. Characteristics of parkinsonism include bilateral involvement, bradykinesia, impaired writing, slurred speech, rigidity,postural and rest tremor disequilibrium, and gait unsteadiness. When cerebellar dysfunction is more prominent, the disease is labeled as MSA-C. Over 50% of individuals with MSA will present with cerebellar dysfunction. Dysfunction to the pyramidal/corticospinal tracts can also occur. However, this symptomatic component does not own a subtype. Signs of corticospinal tract dysfunction (hyperreflexia, impaired muscle performance, spasticity, and a positive Babinski sign) are features characteristic of MSA, but are not used as criteria for diagnosis. There is no “typical” presentation of this disorder, which makes it difficult to detect, and patients often go misdiagnosed. MSA may also go misdiagnosed because the disorder may initially (as mentioned previously) manifest with S/S of only one component. Patients with MSA are most commonly misdiagnosed with Parkinson’s Disease. About 1/3 of people with MSA die while still misdiagnosed. Only 25% of patients with MSA are correctly diagnosed at their first neurological visit. The correct diagnosis is usually established on an average of 4 to 5 years after the disease onset. It is important to differentiate MSA from PAF and pure parkinsonism. According to Lundy-Eckman, the distinction between MSA and parkinsonism is made by exclusion. If no autonomic or cerebellar signs are present, then the patient most likely has pure parkinsonism. It is also important to note that up to 90% of patients with MSA-P treated with Levodopa (L-Dopa) fail to show a sustained, long-term response. This is a sign that this patient does not have pure parkinsonism, as L-Dopa is not effective. In addition, orthostatic hypotension, difficulty urinating, rapid progression of functional limitations, loud breathing,and impotence indicate that MSA is a more likely Dx than Parkinson’s Disease. According to Lundy-Eckman, a patient most likely has PAF if ANS S/S (such as orthostatic hypotension) are present, but signs of parkinsonism or ataxia are not. As there is no “typical” presentation for this disorder, and MSA can often be masked by other diagnoses, it is important if one has a patient with pure Parkinson’s, PAF, etc to keep a watchful eye of any suspicious S/S that are not associated with that diagnosis alone. This is pertinent so that these patients do not go misdiagnosed. While there is generally an absence of marked cognitive impairment, emotional instability may occur later in the progression of the disease. It has been noted that patients with MSA can have great difficulty switching attention from one stimulus to another. A decrease in goal-oriented cognitive ability has also been noted in patients with MSA. Patients with MSA may experience depression. In one study of 15 patients with MSA, 28.6% had moderate to severe depression compared to 3%-4% of healthy individuals. Genitourinary dysfunctions are common symptoms of MSA. Urinary bladder dysfunction may include frequency, urgency, incontinence, and retention. Men may experience erectile difficulties early in the course of the disease. Constipation is also common problem. Dysphagia and dysarthria are symptoms that occur later in the disease and should be treated by speech therapy. Since MSA is a variable disorder and can present in many different ways. Therefore, treatment is symptomatic. To treat orthostatic hypotension: (is defined as a fall in BP on standing of more than 20mmHg in SBP or 10 mmHg in DBP) Drugs can be prescribed to enhance vasoconstriction and increase the blood volume, which will increase the blood pressure (Fludrocortisone and Midodrine). To treat constipation: Stool softener medications are effective. To treat urinary dysfunction: Pharmacological intervention does not adequately reduce post-void residual volume in patients with MSA, but anticholinergic agents like Oxybutynin can improve symptoms of hyper-reflexia. To treat impotence: Sildenafil (25 to 75mg) may be successful in treating erectile failure. There are no currently established pharmacological treatment strategies for cerebellar ataxia and pyramidal dysfunction. Dopamimetics (Levodopa, Dopamine Agonists) and Anticholinergics/Amantadine. A definite diagnosis of MSA can only be made upon autopsy where degenerative changes characterized by cell loss, gliosis, and the presence of cytoplasmic inclusions in the oligodendrocytes are apparent on tissue examination. 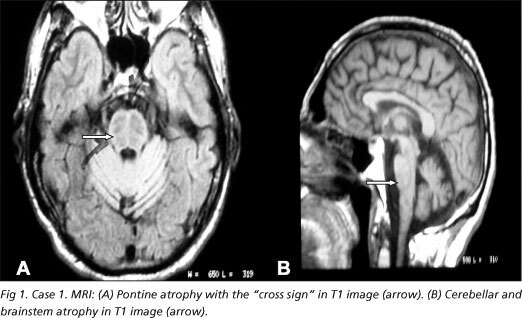 Figure 4: MRI showing visible atrophy of the pontine (A) and cerebellar (B) regions. While MRI and PET scans are of some use, particularly in ruling out other conditions, there is no single clinical feature or investigation that confirms MSA, which has to be diagnosed on the basis of probability (see below) from the complete clinical presentation. In order to better predict the diagnosis of MSA, the Consensus Committees representing the American Autonomic Society and the American Academy of Neurology developed a series of tables, which will help decipher if a patient is a possible, probable, or definite candidate for MSA. Table I defines the diagnostic categories of MSA, which are possible, probable, and definite. Table II displays what clinical features (additional S/S that are often present with that particular domain) and criterion (S/S that are required to be present in order to be diagnosed under that particular domain) are required for the diagnosis of each clinical domain. Table III includes exclusion criterion for each clinical domain. According to recent research, the cause of MSA is unknown. Research has suggested that MSA is characterized by a progressive loss of neuronal and oligodendroglial cells (myelin producing cells in CNS) in numerous sites in the CNS (basal ganglia, cerebellum). This damage is said to occur from the formation of glial cytoplasmic inclusions (GCI’s). GCI’s are thought to be similar to neurofibrillary tangles that are present in movement disorders. Tangles are pathological protein groups found within neurons that slowly cause damage to neurons in the CNS. Once damage has occurred to the CNS (from the formation of GCI's), glial cells come in to repair the damage. A glial scar is then formed in order to protect and begin healing the damaged CNS. It is efficient in suppressing further damage, but it also halts neuroregeneration. Many neurological development inhibitor molecules are secreted by cells of the scar, which prevent complete physical and functional recovery of the CNS. This becomes a repetitive cycle of damage (from the GCI's) and ineffective healing (through gliosis), which will lead to increasingly poor control of the ANS and CNS. While the above process is a current thought among many researchers, the etiology of the process of the initial cell loss is still unknown. Please reference the Associated Co-Morbidities Section. As diagnostic procedures are still being researched, current literature has made it seem that neurologists turn to imaging (MRI, CT, PET scans) tools in order to rule out other possible diagnoses (Parkinson's Disease, etc. ), making MSA more of a diagnosis of exclusion. As mentioned previously, there is no single feature or investigation that confirms MSA. Therefore MSA must be diagnosed on the basis of probability from the clinical presentation. Clinical presentation is not only important for diagnosis of MSA, but is also helpful in treatment. Since MSA is a variable condition, the most effective medical management is symptomatic treatment. Current medical management includes pharmacological treatment. Medication is prescribed according to the subtype of MSA and the symptoms that are present. For more information regarding pharmacological management of MSA, please reference the Medications section. There is very little published literature on physical therapy or exercise intervention for patients with MSA. There is the most evidence concerning patients with MSA-A. Since majority of patients with MSA-A seem to experience orthostatic hypotension, this is a main focus during a treatment session. Nonpharmacological interventions include increasing the consumption of caffeine, salt, and fluids while decreasing alcohol intake and eating smaller, more frequent meals throughout the day. Mechanical interventions include elevating the head of the bed up to 20.3 cm (8 in) for sleeping and using elastic garments. Creating muscle tone in the calves is also helpful in regulating BP. Further patient education should include: advising the patient to refrain from quick postural changes, scheduling activities for later in the day, and avoiding motionless standing activities. Warm environmental temperatures should also be avoided. Swan suggested that swimming might be an ideal exercise, as the hydrostatic pressure of the water counteracts the hypotension the patient is experiencing. During a PT session, it will be important to monitor a patient's BP before, during, and after exercise. It will also be necessary to choose appropriate exercises and environment to avoid these symptoms from occurring. Begin a urinary incontinence program if appropriate. Introducing exercises for the pelvic floor musculature in order to gain control/suppress urge, etc. Fit the patient for the most appropriate assistive device in order to gain independent mobility. This will depend upon the patient’s level of function and safety. If a wheelchair is most appropriate, ensure the chair is one that will best benefit their posture and mobility based upon the function of patient. As a PT, the need to promote independent functional mobility and optimal posture with safety in mind is most important. Resistance training has been proven to be effective in patients with MSA. • In a case study by Wedge, knee extensors and flexors, hip abductors and adductors, and ankle plantarflexors were targeted for resistance training. These muscle groups were chosen because of their importance to balance. • Following this resistance training intervention, marked improvements were noted in the patient's gait pattern evidenced by increased consistency in maintaining good step height and length even when fatigued. A festinating gait was rarely evident following resistance-training. Functional changes were also evident. The patient improved her transfer technique and was able to maintain a more upright posture, which was evidenced by good head and trunk alignment in both sitting and standing. The most important outcome was a decreased frequency of falling. It would appear from this case study by Wedge et al. that a closely monitored, low to moderate intensity resistance training program has no adverse effects on a patient with MSA, and contributes to improvement in function and safety during mobility tasks. Swan et al. has reported that modalities for pain are safe to use, taking the normal precautions. Research reinforces the fact that since MSA is a variable disorder. Each patient with MSA will present differently, so it is difficult to give clear PT advice. Based upon a patient’s level of mobility and function, PT's should use their skills and knowledge to promote a safe and optimal environment for the patient. As a PT, maintaining strength and physiologic fitness as long as possible will be most valuable to the patient. Education of the patient and family on benefits of PT is important for patient/family knowledge and compliance. Make PT goals realistic. Base the goals upon current function and take into consideration the activities most important to the patient. Since this is a progressive disorder, PT's must make sure to re-evaluate goals often to make sure they are appropriate. Wedge F. The Impact of Resistance Training on Balance and Functional Ability of a Patient with Multiple System Atrophy. Journal of Geriatric Physical Therapy 2008;31:79-83. The following case report documents the impact of a resistance-training program on a 68 year-old-female patient with a 2-year history of MSA. Hemingway J, Franco K, Chmelik E. Shy-Drager Syndrome: Multisystem Atrophy With Comorbid Depression. Psychosomatics. 2005;46:73-6. The following case report discusses the some of the struggles in the diagnostic process of a 48 year old man with MSA. Mashidori T, Yamanishi T, Yoshida K, Sakakibara R ,Sakurai K, Hirata K. Continuous Urinary Incontinence Presenting as the Initial Symptoms Demonstrating Acontractile Detrusor and Intrinsic Sphincter Deﬁciency in Multiple System Atrophy. International Journal of Urology. 2007;14:972-74. The following case report demonstrates how urinary incontinence can be the first symptoms of MSA in a 66-year-old female. Goto K, Ueki A, Shimode H, Shinjo H, Miwa C, Morita, Y. Depression in Multiple System Atrophy: A Case Report. Psychiatry and Clinical Neurosciences. 2000;54:507-11. The following case report demonstrates how depression can be the first symptoms of MSA in a 56-year-old female. WE MOVE: Worldwide Education and Awareness for Movement Disorders. Altered functional connectivity of dentate nucleus in parkinsonian and cerebellar variants of multiple system atrophy. 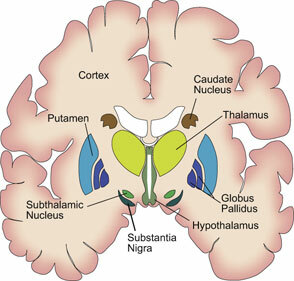 ↑ 1.0 1.1 1.2 1.3 1.4 1.5 1.6 1.7 1.8 Lundy-Eckman, L. Neuroscience: Fundamentals for Rehabilitation. 3rd ed. St. Louis: Saunders Elsevier, 2002. ↑ 2.00 2.01 2.02 2.03 2.04 2.05 2.06 2.07 2.08 2.09 2.10 2.11 2.12 2.13 2.14 2.15 2.16 2.17 2.18 2.19 2.20 2.21 2.22 2.23 Swan L, Dupont J. Multiple System Atrophy. Journal of Physical Therapy 1999;79:488-94. ↑ 3.00 3.01 3.02 3.03 3.04 3.05 3.06 3.07 3.08 3.09 3.10 3.11 3.12 3.13 Wenning GK, Braune S. Multiple System Atrophy: Pathophysiology and Management. CNS Drugs 2001;15:839-48. ↑ 4.00 4.01 4.02 4.03 4.04 4.05 4.06 4.07 4.08 4.09 4.10 4.11 4.12 4.13 4.14 4.15 Wedge F. The Impact of Resistance Training on Balance and Functional Ability of a Patient with Multiple System Atrophy. Journal of Geriatric Physical Therapy 2008;31:79-83. ↑ 5.00 5.01 5.02 5.03 5.04 5.05 5.06 5.07 5.08 5.09 5.10 5.11 Diedrich A, Robertson D. Multiple System Atrophy. Vanderbilt University School of Medicine 2009. http://emedicine.medscape.com/article/1154583-overview (accessed on 24 Jan 2010). ↑ Hemingway J, Franco K, Chmelik E. Shy-Drager Syndrome: Multisystem Atrophy With Comorbid Depression. Psychosomatics. 2005;46:73-6. ↑ 7.0 7.1 7.2 7.3 7.4 7.5 7.6 7.7 Hardy, Joanne. 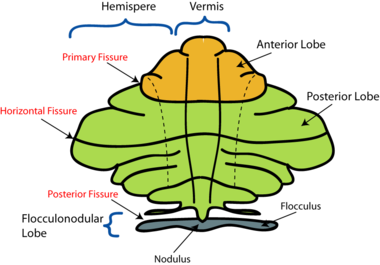 Multiple System Atrophy: Pathophysiology, Treatment and Nursing Care. Nursing Standard 2008;22:50-6. ↑ Hain TC. Multiple System Atrophy. 2010. http://www.dizziness-and-balance.com/disorders/central/movement/msa.html (accessed on 5 april 2010).